For two consecutive years now, Pathfynder has been the official social media partner of JAS (Jewellers Association show). Jewellers Association Show is a renowned annual jewellery show which makes Jaipur the focus of the world jewelry industry. This event highlights the art of jewelry making apart from focusing on a wide variety of precious metals and colored gemstones and showcasing new trends and technology in the jewelry industry. It is a great platform for the exhibitors to network with their trade partners and consumer clients. The targeted visitors at Jewellers Association Show – JAS 2012 are buyers, traders and retailers from various parts of India and the world, looking out for new trends and opportunities in jewellery. Pathfynder attended JAS and captured it online on facebook by covering a breathtaking variety of loose color gemstones, gold and diamond jewelry, platinum jewelry, silver jewelry, studded traditional jewelry and much more along with equipments and machinery used in jewelry manufacturing. 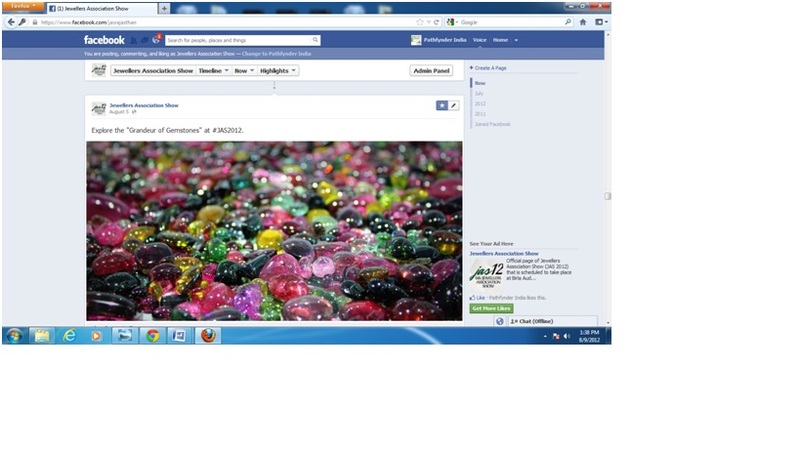 Various renowned jewelers and their designs were shared on the page along with their specialties. Last year JAS had starting covering the event on social media. This year a change in trend could clearly be seen from conventional media to the social platform. The awareness about the growing need and importance of social media has increased to a large extent in the jewellery industry. 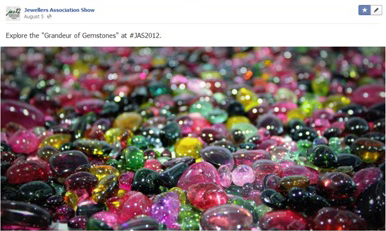 JAS 2012 witnessed jewellers from every walk of life taking initiative and active participation in exhibiting their designs on social media and appreciating it as an upcoming interactive medium of marketing. 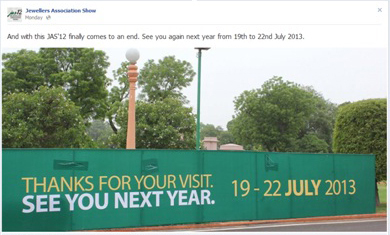 The quality of pictures and instant feedback obtained on the designs shared on Facebook was an immense pleasure and acted as a driving force for all the exhibitors to start exploring the social media platforms.